Imagine the nerve. With behemoth Boston to the north, and prominent Providence to the south, could an obscure, small, tired, old mill city – derogatorily known as "The Bucket" – really expect to become an artistic hub? The answer is, yes. And, after talking to Herbert Weiss, Pawtucket's economic and cultural affairs officer, put an exclamation point at the end of that sentence. Like a phoenix rising from the ashes to live again, so is Pawtucket Rising. In fact, that's the name of the new documentary by local filmmaker Jason Caminiti about the historic city's renaissance. WSBE Rhode Island PBS will air the film on Thursday, January 22 at 10 PM and on Saturday, January 24 at 7 PM on channel 36, digital 36.1, Dish 7776, DirecTV 36, and on cable channel 8 in RI (Massachusetts cable subscribers should check their cable listings for the local channel number). 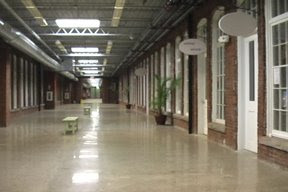 The documentary profiles the birth and evolution of Pawtucket's arts district through adaptive reuse of empty century-old factory buildings as an engine of economic revival. The birthplace of the American Industrial Revolution grew in prominence and wealth during the manufacturing decades in the first half of the 20th Century. But decline in domestic manufacturing left numerous structurally sound but unwieldy brick giants abandoned and unused. 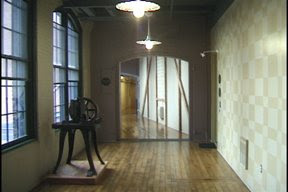 Designer Morris Nathanson advocated for preserving and converting the mills – with their wide open spaces and massive windows and natural light – into living and working spaces for artists. He started the community ball rolling in the late 1980s when he acquired one of the city's 17 vacant mill buildings. Located on Exchange Street, across from Tolman High School and behind City Hall, the mill's high profile location on a hill is an inspiring metaphor for Pawtucket. Officially, this city of just over 72,000 has been incubating visual and performing arts venues for about a decade. Pawtucket Mayor James Doyle and the visionary team he assembled - led by Herb Weiss for the past 9 and a half years – have put real city-side muscle behind the dream. No fruitless and insincere glad-handing; Pawtucket initiated the state and municipal legislation necessary to permit the arts and entertainment district to exist and flourish in its borders, and continues to allocate necessary resources years later. For the city, the municipal and community partnership spurs purposeful economic development, turning abandoned real estate liabilities into assets. 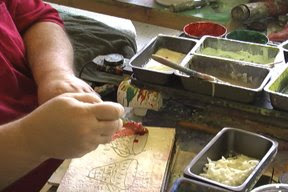 For artists, the partnership enhances art education and awareness, and encourages development of affordable live-work spaces. Finally, the partnership preserves the historic character, architecture, and charm of Pawtucket – that benefits the whole city and even the state. 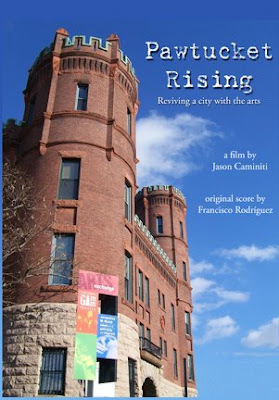 Although the film focuses on Pawtucket, its valuable message applies to urban cities anywhere. In fact, that's how the film came to be, according to Caminiti. Interested in documenting the history and arts culture of his own adopted city of Fall River, the Newport, RI, native was told about Pawtucket by a friend. What Caminiti found in Pawtucket was a great story with a greater lesson: cities past their manufacturing prime can flourish and grow in new directions - if elected officials sincerely support the effort and collaborate with leaders in the community.